Since Mr. Savvy and I don’t have kids other than the fur variety, I love making up fun and silly holiday greetings. 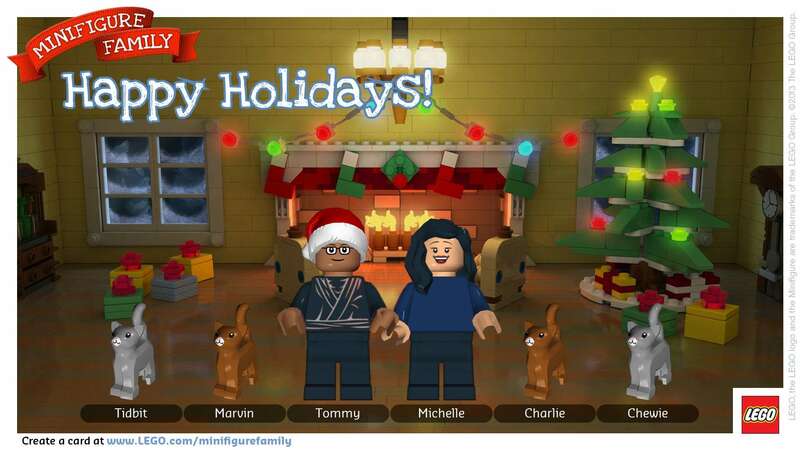 So, I was smiling with glee when I saw that you can turn your family into a LEGO Minifigure Family holiday greeting, including your cats and dogs! All you have to do is head over to MinifigureFamily.com. I had a lot of fun making our LEGO Minifigure family as they are so super cute, customizable and the site is easy enough for kids to use as well. I really love that you can customize your LEGO Minifigures so well, including facial expressions, skin tone, and clothing. Plus, you can also select your own scene, so your family can be playing in the snow, warming up by the tree and cozy fire, visiting outer space, or just about anywhere in between. I love that the LEGO Minifigure families are so cute, but also are very easy to make and it only takes minutes! One of my favorite parts though, was being able to include our crazy cats as a lot of similar types of fun sites sadly just don’t offer that option. Once you have your family all Mini-figed for the holidays, you can share your family’s LEGO creation on your social networks, and also save it to print out or stick in your virtual scrapbook to remember next year. What’s your favorite scene for the LEGO Minifigure family holiday greetings? I’m hoping they add a Star Wars theme for next year!